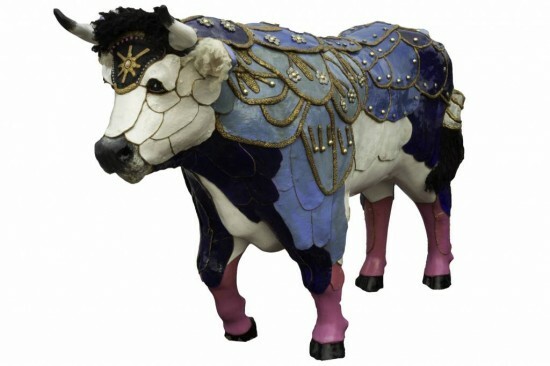 "ArtToro" was awarded Honorable Mention by our panel of Stampede Judges. Congratulations! ArtToro is an ox from Hopewell Valley, NJ. He is friendly, approachable, majestic, and powerful--but also a bit sassy, too. In a reversal of roles, he is dressed as a matador in his traje de luces (suit of lights) with the metallic trim, and especially the highly decorated shoulder pads. He is arrayed with multiple sections, mimicking plates of armor, giving him extra power and self-defense. He has an armadillo-like tail, further enhancing his protection. Below his knees are the rose colored stockings that are typically worn by the matador. His hooves are polished and black, similar to the zapatillos (shoes) of the matador. The end of his tail, his ears and his forehead are finished with dreadlocks, which are the corded hair of a Puli dog, a Hungarian sheepdog. In his ear, he has a large metal earring where he normally would have his tag, giving ArtToro just a hint of a hip attitude.